History books tells us that Minuit bought Manhattan Island for sixty guilders' worth of goods, although the details of the actual transaction are not documented in a contract. There is a compelling piece of evidence, from the Dutch point of view. It's a letter, from November of 1626, discussing the purchse and noting the price of "60" guilders. 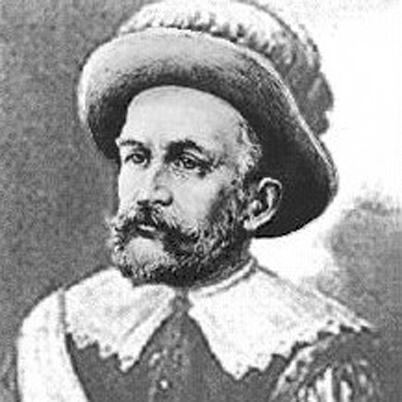 In this clip—from "The New York Connection," a Dutch public-television series—we see the legendary place where Minuit made his deal with Native Americans. The host of the program is Dirk van Weelden, a Dutch author. He is speaking Dutch—the language of those early colonists. This clip gives us an opportunity to hear what was once a commonly spoken language in today's New York (and gives us the source of the island's name). Bos, Carole "Peter Minuit - Purchase of Manhattan Island" AwesomeStories.com. Jul 22, 2013. Apr 20, 2019.